NETWORK FINALS: DESIGNATED SURVIVOR lost 0.1 in final numbers, and EMPIRE gained the same. CABLE HIGHLIGHTS: FX’s AMERICAN HORROR STORY tends to start very big and then plunge before stabilizing, and the pattern held with a 0.99 drop from last week’s season premiere to 1.79. (Last year’s Week 2 drop was 0.84.) On Comedy Central, SOUTH PARK fell 0.35 to 0.97, and LEGENDS OF CHAMBERLAIN PARK was off by a tenth to 0.27. On Lifetime, LITTLE WOMEN LA and LITTLE WOMEN ATLANTA were both at 0.51, respectively down 0.09 and 0.07. News events put telecasts by both CNN and Fox News in the Top 10, tightly packed in 18-49s (CNN peaking at 0.47, Fox News at 0.44), but with the latter far ahead in the older-skewing total viewers demo (3.23M vs. 1.51M). OWN’s QUEEN SUGAR dropped 0.11 to 0.44. The season finale of USA’s MR ROBOT rose 0.07 to 0.39, and the lead-out “advance screening” of the pilot for FALLING WATER was at 0.16. Nickelodeon’s late afternoon LOUD HOUSE was just outside the Top 10 at 0.38. MTV’s CATFISH slipped 0.03 to 0.35, and UNLOCKING THE TRUTH edged up 0.02 to 0.15. On Food Network, WORST COOKS dropped 0.12 to 0.34, and CAMP CUTTHROAT was down 0.12 to 0.20. HGTV’s PROPERTY BROTHERS fell 0.08 to 0.34, with HOUSE HUNTERS down 0.09 to 0.31, and HOUSE HUNTERS INTL down 0.08 to 0.26. Bravo’s DON’T BE TARDY lost 0.14 to 0.31. 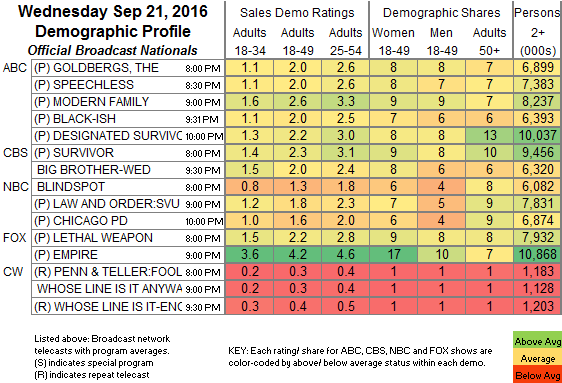 E!’s HOLLYWOOD MEDIUM actually managed to climb, by 0.04 to 0.27, and BOTCHED BY NATURE stayed at 0.22. On Discovery, DUAL SURVIVAL was down 0.05 to 0.24. 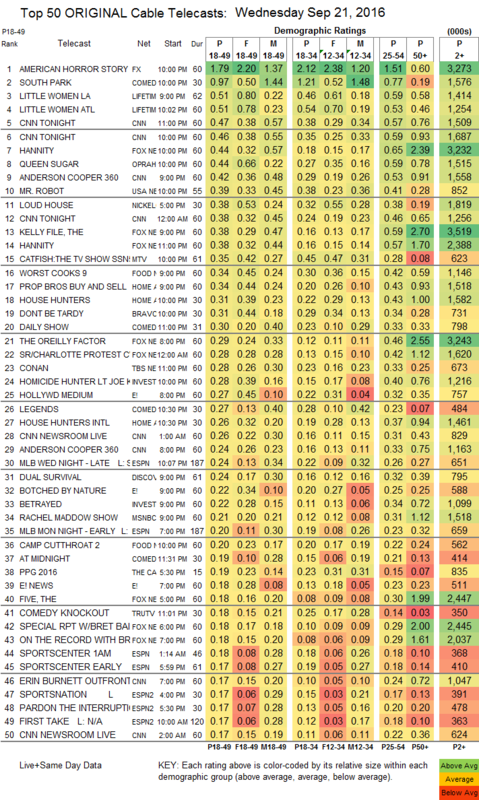 On TLC, TODDLERS & TIARAS fell 0.08 to 0.16, and LOVE AT FIRST KISS held at 0.10. Syfy’s GHOST HUNTERS dropped 0.05 to 0.16, and PARANORMAL WITNESS ticked up to 0.15. FXX’s YOU’RE THE WORST took a 0.06 hit to 0.08. HBO’s ANY GIVEN WEDNESDAY rose 0.02 to 0.08. IFC’s DOCUMENTARY NOW lost a tick to 0.04/112K. Sundance’s GOMORRAH was down a hundredth to 0.02/83K.